I was inspecting a home in Houston’s First Ward last week. From the porch, I had a glorious view of downtown. I was also close to the freeway, which was not so glorious, but the house was quite nice. The exterior wall did not offer any clues that additions had been added. The roof seemed out of place though: two gables near each other. The pier and beam foundation heightened my suspicions that the original home had been smaller, but when I entered the attic, I saw the full picture. Considering that this would have been about a 1000 square foot home when it was built in the 1920s, I could see why additional space was desired. By the early 1970s, we were up to 1700 square feet, which was the square footage of this home (we are now up to almost 2500 square feet being the standard). As long as we have the yard space, I think we will find homeowners seeking ways to add square footage with an addition. What I found in the attic concerned me, but the discovery may not bother your general contractor. Many years ago, another home inspector and I were looking at the same house. The home was in the process of having an addition built. I saw it as a problem, while the other inspector, who had been a general contractor, did not see an issue. The crew had built the framing onto the existing roof. They had not removed the shingles or the sheathing. I was also looking at a vent pipe going through the roof that I was not happy about. The other inspector said no worries, the job was done right. Maybe. In the attic, I saw that there had been two additions to the house. A rear bedroom had been added. The gable roof over the bedroom flowed from the surface of the older roof like it had always been intended that way. From a design perspective, it was well done. The front addition must have taken a smaller porch and incorporated it into a front room. A new larger exterior porch was added for an outdoor living space. Quite a useful design for adding wanted space. The roof was converted into a gable roof over this space. The work had been done some years ago, and the crew did tie in the features with the older parts of the home, but the two gable roofs next to each other in the front did not look right. The home had composite shingles on it now, but the original shingling was made from wood. Composite shingles cannot support themselves, so they are placed over sheathing. Wood shingles are placed on battens that stretch over the framing. In the picture below, you see the battens running horizontally across the framing members. Here is my problem: this element in the framing was meant to carry the weight of a shingle, not the weight from new framing. For that matter, on that house all those years ago, the new framing was sitting on sheathing, which was only meant to hold the composite shingles. I found no issue with the roof surface, but what about a large tree branch falling on this section of the roof? You see, a large tree was on one side of the home. What was worse to me is that the other additional roof was attached to the wood shingles then the batten boards. Again, no problems noted, but still a concern. I have seen contractors take this quick way out when attaching an addition. However, when examining the house of a friend, I saw that the contractor had taken off the roof, and he rebuilt the framing to properly support the weight. This roof would have no problems in a windstorm if something fell on it. 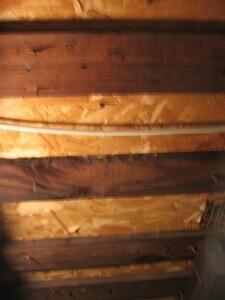 The framing also gave easy access to that part of the attic, so insulation could be done, or repairs could be made. As I mentioned, during my examination of the roof additions on that older home, I saw no damage, but I did place this in my report as being wrong. We have to concern ourselves with the potential for issues than just the immediate state. If you are planning an addition, ensure that the contractor will remove all of the roof down to the framing and then he should build his new framing to attach to this older framing, if you want something that will last. This entry was posted on Wednesday, January 12th, 2011 at 4:34 pm	and is filed under Home Maintenance-Consumer Info. You can follow any responses to this entry through the RSS 2.0 feed.